Whether you’re making dinner for your family or hosting a fabulous dinner party, the electric pressure can get you to the table quickly and deliciously. Looking for a super-flavorful, nourishing bowl of lentil soup for tonight’s dinner? The Instant Pot (AKA electric pressure cooker) has you covered. Hungry for Beef Bourguignon? No problem! 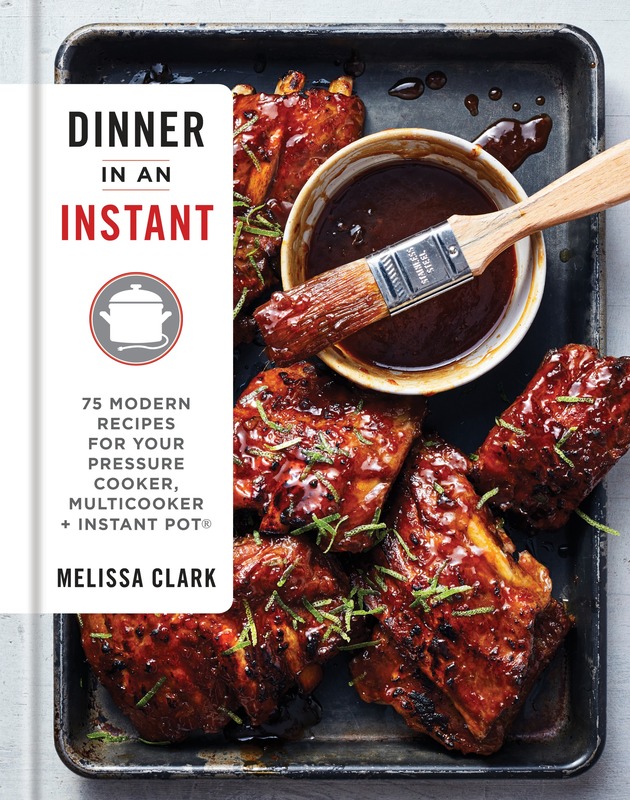 Joining me on today’s podcast with insights into this wildly popular appliance is Melissa Clark, author of Dinner in an Instant: 75 Modern Recipes for Your Pressure Cooker, Multicooker + Instant Pot and reporter for the New York Times food section. Promising convenience and versatility, electric pressure cookers are the must-have countertop appliance for busy home cooks. When I first got my hands on one, I didn’t find it as intuitive as I imagined. But after a few newbie snafus, my Instant Pot has quickly become my favorite time saver in the kitchen. From braises and beans to lentil soup, ribs and even dessert, the electric pressure cooker can unlock delicious and healthy recipes for your family to enjoy. If you were like me and needed a little help getting started, then this week’s show is a perfect place to begin. 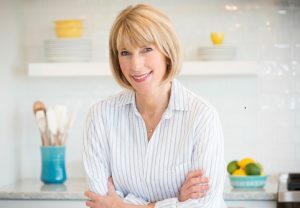 Here to the rescue with secrets for cooking colorful and creative recipes in the electric pressure cooker is my guest, Melissa Clark. Like many avid cooks, Melissa was fascinated with the promised potential of the pressure cooker, and what she discovered was nothing short of a kitchen miracle. Because of the high pressure sealed inside the cooker, recipes that typically take hours to cook are done in less than half the time. 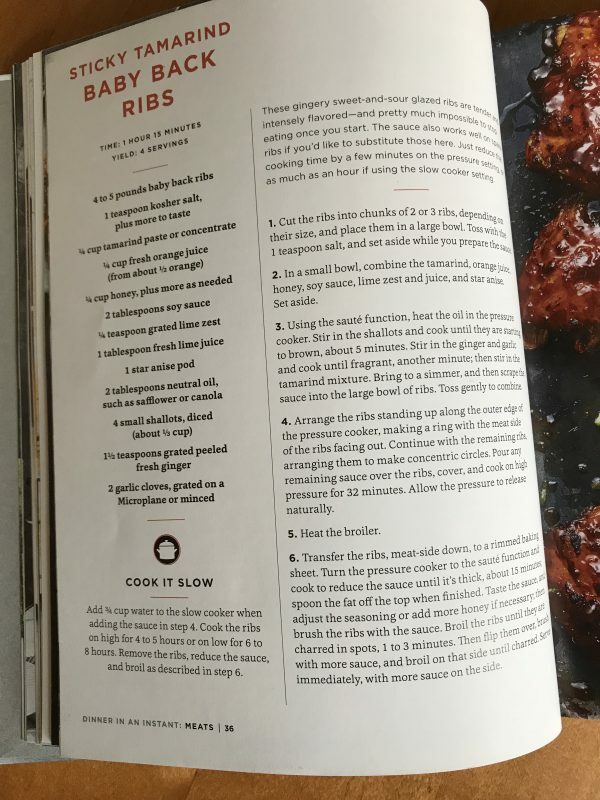 On the show, we dish about recipes that work wonders in the Instant Pot including her Vietnamese-Glazed Salmon (which I’ve made five times already) and the recipe that’s on the cover of Melissa’s cookbook for Sticky Tamarind Baby Back Ribs. Next up on my to-make list are some of the dessert recipes from the book. Why Melissa decided to write Dinner in an Instant. Why pressure cookers are excellent for braises and beans. Melissa’s process for developing recipes. The recipes Melissa’s daughter loves to eat. How the Vietnamese-Glazed Salmon recipe takes just one minute to cook. Cheesecakes and custards are perfect for the pressure cooker. Questions from the Podcast Posse! Why the Instant Pot has taken off. Comfort food for all of your weeknight dinners. Melissa doesn’t have a magic formula for converting traditional recipes for the pressure cooker. Here about her conversion approach. Melissa’s favorite chefs and cookbooks. Enter to win a copy of Melissa’s cookbook. Do not be afraid to experiment! There is a learning curve with the electric pressure cooker. 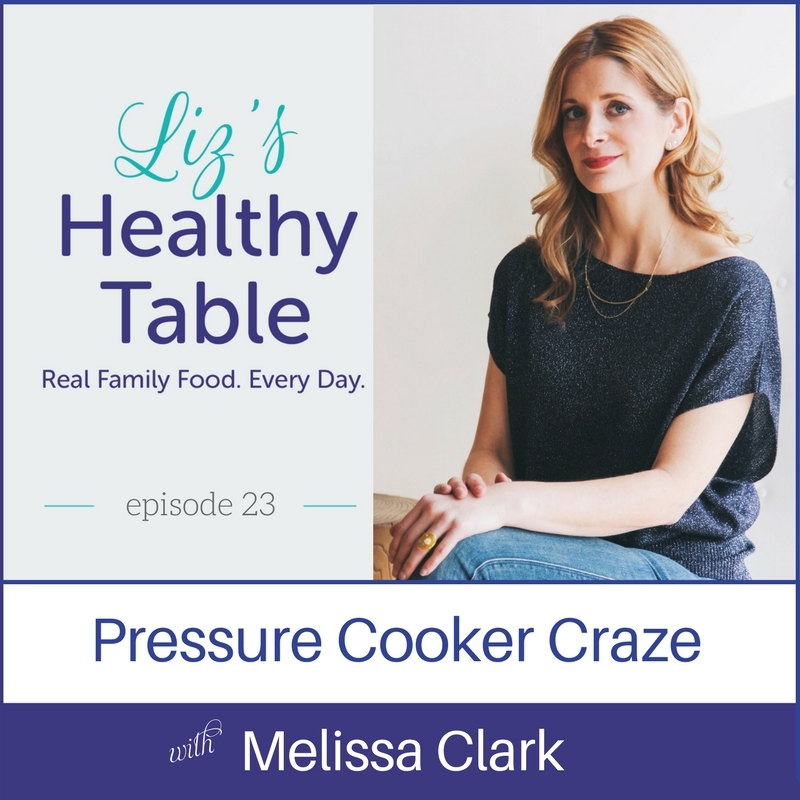 Tune in to Liz’s Healthy Table #PODCAST w/ @melissaclark and learn how to make delicious, healthy meals in the #InstantPot. Salmon, baby back ribs, lentil soup, dessert. We have it all! Chicken Long Rice Soup. Which my 3 year old always helps me make! I would love to have this book to help me make more quick, healthy, and delicious meals for my busy family. I want to spend less time cooking and more time playing with my toddler after work. My favorite things are hard boiled eggs and baked potatoes. Great way to save time! I want to use my pressure cooker more often. Hi! I just received my Instant Pot last week and cooked quinoa and chicken breasts in it with success!! I can’t wait to cook so much more!! Looking for recipes is so exciting! Honestly, I am still learning and have not found a favorite but for big family meals…potatoes. I bought an Instapot last summer but have been afraid to try it out…this cookbook looks like the inspiration I need to get started! Listen to the show. It will inspire you!! I am catching up on listening to several podcasts. You are right Liz. This one regarding using an Instant Pot did inspire me!! I loved this show. Are there any other topics you’d like me to tackle? I love to make greek yogurt, hard boiled eggs, and risotto. I tend to stick to the same few things and would love a cookbook with lots of versatile recipes! I love making homemade macaroni and cheese for my kids. It is so fast and delicious! 4 minute cook time! Any kind of soup. In fact live just mixing up the leftover veggies in my fridge and seeing what comes out. Usually yummy! Want to get some main dish ideas! Sounds fun!! I don’t have an instant pot, but I’d love to cook some pulled pork or other versatile type meal! I want to win because I was given an Insta pot that is still in the box because I am daunted by the learning curve. Looking through the cookbook would surely inspire me! My favorites are beef stew and porcupine meatballs. I would love me to win the book to find som new inspirations to cook. Thanks! I recently got a pot and have made a few different kinds of vegetable soup -using up veggies that were dying in the refrigerator. I’d love to learn how to use the pot for other types of foods. This cookbook sounds great! An Insta Pot is on my wish list. With a busy family of 6, putting healthy meals on the table every night can be a chore. We need some Insta help! I just love this thing ! Love the convenience of “boiling” eggs!! Get lots done at one time for deviled eggs. YUM! I would love to win this cookbook to give me a kick start to using the Insta Pot! I have recently purchased an Insta Pot, but have not used it yet. I’m a little intimidated. ‘m hoping it is a tool that my 17 & 15 oy daughters will embrace & help out with meals. We were just talking about it this evening at dinner and my husband said lets get it out this weekend! I think we’ll try the ribs or the salmon that’s always a favorite. The cookbook would be so helpful! You will love it. My friend’s college-age kids have been using it a lot lately. I’m sure your high school kiddos will enjoy playing around with the IP with you! Have fun, and tune in to the podcast. Lots of inspiration on the show. I would love to win this book because my sister keeps telling me how wonderful the instant pot is and this would give me ideas to try. Right now, I don’t cook much in my instant pot – mostly soups and chicken. That is why I need to win this cookbook! I need to expand my offerings! My favorite instant pot recipe is spinach and lamb. It cooks the lamb so quickly, and it is just tender and delicious. A great way to get veggies into our meal as well. It’s a family favorite. We just bought an instant pot and have used it 3 times now. Our favorite so far is broccoli cheddar soup. Have always wanted to make it and was so easy using the instant pot. It was so delicious! Can’t wait to try out other recipes with it! Is it an Instant Pot recipe or did you find it online or in a cookbook? I’d love to try it. I love the instant pot! I would also love more recipe ideas. My favorite thing is to chunk chicken, cover it with a sauce (for orange chicken or ginger chicken or salsa, etc) and it only takes 5 min to cook. Love the convenience and speed. I bought myself one for Christmas – but haven’t used it yet. I guess I’m a bit intimidated by it. I really need a good, in-depth cookbook to walk me through it. I love it all the time, especially for hard boiled eggs and yogurt. Never had a meal we didn’t like. I use mine about 5 times a week! I tend not to follow recipes and have used it for quickly cooking meats. I had a pork tenderloin come out amazing and just guessed at the timing of it. Normally, I would have to set it in the slow cooker and be away for a 9-10 hour day at work which results in a dry tenderloin at best! Would love to have a cookbook that has some practical recipes since the one I purchased when we first got it is not REALLY what we enjoy eating as a family. I’d love to win the cookbook for her. So glad you received your book. I mentioned the giveaway to Melissa on this week’s show, and she was blown away. It’s been so fun shipping the books all over the country! I love my Instant Pot! This week alone I’ve made steel cut oats, lentil soup, and black beans. Last week beef stew and more steel cut oats. 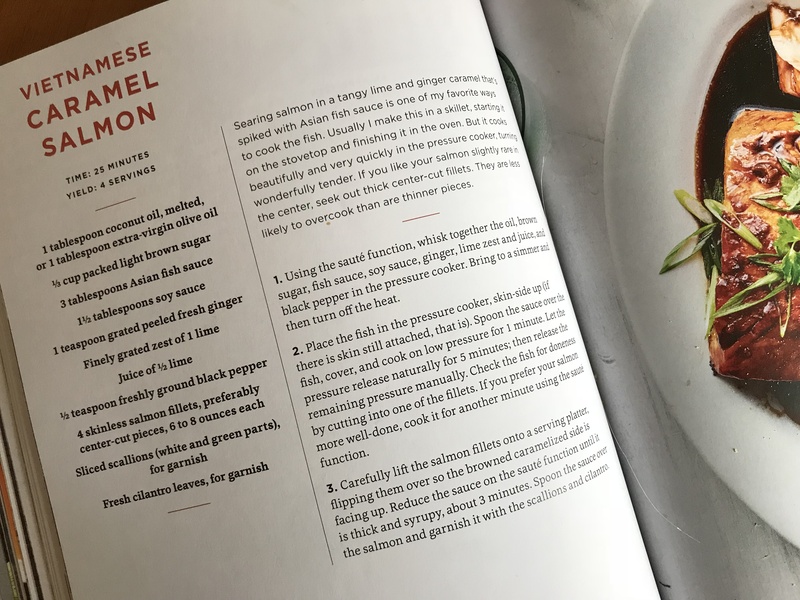 I’ve never tried salmon before—will have to give that recipe a try! Thanks Liz! I’d love to win! My Instant Pots Faves: brown rice, quinoa, hard boiled eggs. I have been intimated by my Instant Pot. My husband has used it a few times to make chicken. I am ready to dive in! Good to know! Tune in to the show. I think you’ll really be inspired. I’m so glad I listened to this podcast. I’ve only cooked chicken breast in my insta pot and it didn’t turn out great. Now I know why! I would love this book! Yogurt is so yummy in the Instant Pot! Then I can add whatever I want to it. There are so many options. thanks for sharing the salmon recipe. It will be dinner tonight! I am having trouble loving my new instant pot. Some tried and true recipes would definitely benefit and enhance my learning curve with this instant pot. So far cooking in the instant pot, I feel like one of the worst cooks in America. Oh no! Please tune in to the show. I think you’ll be re-inspired. I made Melissa’s lentil soup and added extra carrots and I used fresh tomatoes vs canned. I’ve been adapting recipes as I go! I want to learn more about using the Instant Pot. Made yogurt twice and could not get it thick like Greek yogurt. Also the directions do not tell you prep time ( how long it takes to reach pressure)- or temp of milk. So the cook time may be short , but food prep & time to reach pressure temp should be included . Would love to expand my recipes with this book . Have made chicken thighs & chocolate cake . Chocolate cake. Yum. I’d love to try that! Brown Rice cause it’s ready to cook in now time flat! I would love to win this book in order to cook more varied delicious meals. My favorite is my grandmother’s German dish. Excuse me if misspelled. Rouladins. Pounded steak, bacon, mustard, and onion. Cooked to perfection! Looking for more inspiration for the Instant Pot! I use mine at least twice a week. Applesauce is incredible and so quick! So far I only make Greek yogurt in my pot. Would love to learn how to make more dishes. I would also share them with my sister who is learning how to cook in her pot. My favorite thing to cook is corned beef! Love it in the Instant Pot! Embarrassing that I have had an Instant Pot for 2 years and used it only once, yet I use my slow cookers weekly. I needed this push to get using the instant pot. Thanks Liz!! I WHOULD LOVE THIS BOOK TO GIVE ME MORE MEAL PREPPING IDEAS FOR MY FAMILY BUSY LFE. I LOVE TO COOK ,BUT BEING A WORKING MOM OF THREE SMALL KIDS WITH LOTS OF AFTER SCHOOL ACTIVITES THINGS CAN GET BUSY! I FIND THE INSTA POT VERY INTRESTING AND FUCTIONAL. I love making rice in my instant pot and I’ve made a couple of casseroles but would love the cookbook to expand my menu and use it much more! As a busy momma it is such a time saver! I have been thinking about an instantpot, this would be great to win! Roast beef with vegetables and gravy. My favorite thing to prepare in my instant pot is maple smoked brisket. The family loves it. I’ve cooked Chinese Pork Belly in 20 minutes and my kids LOVED it. I couldn’t believe how fast! Love my new device. Would love to learn new recipes! I have had an Instant Pot for over a year but just need some help of what to do this it. This pod cast and cookbook look like a great start. I’d love to win a cookbook because I haven’t used my instant pot much yet and I’d love to have some quick tasty recipes. My fave thing to cook in my instant pot is ground beef. I cook it up and then freeze it to use later for tacos, hamburger helper, spaghetti sauce and so so much more. I am very new to the instant pot world. Just made our first meal tonight. Would love to cook healthy Chinese and meats in it. Yummy soups would be a favorite too. I own a sushi restaurant but depend on your podcast and recipes for inspiration for cooking meals at home for my 2 growing boys (ages 11 and 14) and husband! Really enjoyed the podcast about the electric instant cooker. I have a Korean version from 10 years which I have used almost daily for rice & mixed beans with rice, and am so excited that the technology has advanced 5 steps up to include so many new features! Hoping to make some yogurt and other fun meals soon. I LOVE using it for broth— FAR easier than any other method. Love the podcast– keep them coming! So glad you’re enjoying the show! LOVE my Instant Pot! As working mama it just makes life convenient and much yummier for all of us! Weeknight go-to’s are chicken and dumplings and taco pasta. But I love using it for food prep as well – having rice and hardboilded eggs ready for the week…yes please! I need to do a lot more experimenting with my Instant Pot, but I love making steel cut oats and hard boiled eggs. I love making rice and chicken. Just tried boiled eggs. I love the idea, but have been nervous to try. This cookbook would be a great resource. Thanks for all the excellent tips. I am loving the show!! My favorite thing to cook in my Cuisinart pressure cooker is mac n cheese & pot roast! You could do a lot with dinner with the pressure cooker!! I just got one and haven’t used it yet! This book would help since I’m a newbie! My favorite dish to cook in the Instant Pot is Mac & cheese because it’s so fast and filling. I’d love to win the cookbook for inspiration for cooking dinners. Melissa has a mac & cheese recipe that I’ve been itching to try! My favorite recipe is pork carnitas using a pork tenderloin in my pressure cooker. I love to cook, but could use some inspiration when it comes to my pressure cooker. Thanks for the great podcast! My pressure cooker does not get abreak on the weekends! I make soup all weekend long and freeze the leftovers. During the week, if I know I don’t have time to cook dinner, I can just pull a soup out to heat up for my family. Also, I just made some vanilla extract in my pressure cooker. Instead of taking weeks and weeks to make vanilla, it took 30 minutes of cooking time! I would love this cookbook because I love looking at recipes and adapting them into what works for my family! I love making bone broth in my IP. I’d love a cope if the cookbook because I’d love to know more ways to use it for weekday dinners. I actually bought an instant pot, a small one but feel too little since recipes generally are for the larger size. I actually returned it and still pondering do I want one? A good cookbook would definitely turn my thoughts to owning one. Thanks. Would love to save on time plus learn new recipes! Would love the opportunity to do so! What was her favorite electric pressure cooker that she suggests buying? She didn’t have a favorite but the Instant Pot, for example, has other features like the slow cooker and yogurt maker. So if you want lots of features, that’s a good one to go for.